The Toft and Toban families both have roots in Eastern Europe. Sarah Toban (nee Kramerman), born 1873 in Latvia, married Samuel Toban, born 1871 in Russia. Together they had 6 children: Harry Toban, Dave Toban, Florence Toban, Louis Toban, Alfred Toban, and Minnie Toban. Samuel Toban arrived in Vancouver in 1910. He sent for the rest of the family shortly after, and the Sarah Toban and her 6 children immigrated to Canada in 1911, aboard the C.P.R. Steamship, “Lake Michigan”. They arrived in Quebec on May 11, 1911, and traveled to Vancouver to join Samuel Toban. After moving to Vancouver, Samuel Toban ran a shoe repair shop on Davie Street. Samuel Toban died April 14th, 1951, in Vancouver, BC. Sarah Toban died on February 3rd, 1965 in Vancouver BC. Sarah and Samuel’s eldest child, Harry Toban, was born in 1895 in Ukmerge, Lithuania. He was known as the proprietor of Toban's Shoes and Quality Shoe Stores in Vancouver, along with his brother Dave. Harry Toban also bought Millar & Coe. China store, which was located on Hastings and Homer. Millar & Coe. sold china, glass, and pottery. Harry was married to Mona Toban (nee Krackovsky) in August of 1924. Together they had 4 children. Harry Toban was active in the Jewish community in Vancouver. Being Schara Tzedeck's president in the 1940's, Harry Toban led the synagogue's move from Heatley Street in Vancouver's East End neighbourhood of Strathcona to Oak street in Vancouver's Fairview neighbourhood, in South Vancouver. Harry Toban died on June 26th, 1995 in Vancouver, BC. The next son, David Saul Toban, was born in May of 1898 in Ukmerge, Lithuania. He married Shirley Toban (nee Hinda/Singer). They had one child together: Ronald Stanley Toban, born December 28th, 1935, died August 27th, 1970. Dave Toban ran Toban's Shoes and Quality Shoe Stores in Vancouver in conjunction with his brother Harry. Dave (David) Toban died August 25th, 1985 in Vancouver, BC. Their first daughter, Florence Rita Nemetz (nee Toban) was born July 15th, 1906 in Ukmerge, Lithuania. She married Boris (“William”) Nemetz in 1927. They had one son, Arnold Nemetz. She died October 28, 1946 in Vancouver, BC. The next child, Louis Toban, was born in 1909 in Ukmerge, Lithuania. He married Eva Jennie Toban (nee Goodman). They had 2 daughters: Arliss Miller (nee Toban) and Myrna Mitchner (nee Toban). 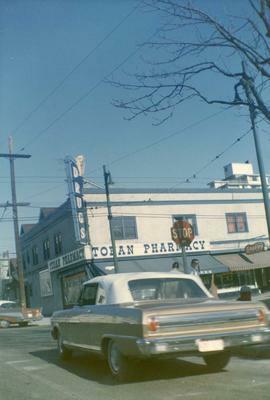 In 1926, Louis opened up a chain of 12 drug stores, called Toban’s Reliable Drug stores. Louis was a philanthropist and was active in the Jewish Community in Vancouver. He was recognized as one of the early organizers of the Easter Seal Campaign, and served as a director of the campaign for many years. Louis also served as Schara Tzedeck president and board member, and was an active participant in the Jewish National Fund. Louis Toban was also a supporter of health care, and donated to Vancouver Children’s Hospital, and St. Paul’s Hospital. He was made an honorary member of the B.C. Pharmacy association and received an award in 1969 for his outstanding contribution of the pharmaceutical profession. There is not much known about Alfred Toban. He was married and had at least one son, Martin E. Toban. Mina (Minnie) Toft (nee Toban) was born in Ukmerge, Lithuania in 1910. Minnie attended the Mount Pleasant School, a Vancouver public school near the intersection of Broadway and Kingsway. She worked in a City Hall office until her marriage to Fred Toft, a furrier from Winnipeg, in 1937. Fred opened his own fur shop, Alaska Fur Co., on Granville Street. They had two children, Milton Toft, and Arthur (Art) Toft. After her children got older, Minnie began working in the licensing and permits office of the Provincial Government. She retired at age 65 and started volunteering in the Congregation Schara Tzedeck office, serving as treasurer amongst other duties for the Schara Tzedeck sisterhood from 1981 to 1984. Minni Toban died on January 30th, 2007 in Vancouver, BC. Minnie and Fred’s first child, Arthur (Art) Toft, married Rachel Eiger. They had three children: Amir Eliezer Toft, Oren Amir Toft, and Karen Ann Toft. Minnie and Fred’s second child, Milton Toft, married Jackie Kappe. The Toft family also originated in Eastern Europe. Moshe Toft, born in 1871 in Lithuania, married Channa Rashe Toft (nee Tobias). (Some early documents record the family name as 'Tobias', likely due to confusion surrounding Channa Toft’s maiden name, Tobias). Moshe became a blacksmith and a piano teacher. Moshe and Channa had 4 children: Miriam Rivka Epstein (nee Toft), Saul Toft, Altke Viner (nee Toft), Harry (Chonka) Toft. Channa Rashe Toft then died at an unknown date. Moshe remarried around 1907 to a piano student, Rachel. Moshe then had 5 more children with Rachel: Brynke Toft, Fred Toft, Leonard Toft, Dvorah (Devierke) Toft, and Bluma Toft. Not much is known about Brynke Toft, Leonard Toft, or Bluma Toft. Fred Toft was born in the town of Trope (Traipe), Lithuania on September 15, 1910. Fred immigrated to Canada at an unknown point in time, and traveled to Winnipeg with his nephew (Aaron/Aharon Leifer) and his half-sister (Miriam Rivka Epsetin). Money was sent to Canada from an uncle (Lazarus) and Aaron, Miriam and Fred were able to buy a house. Fred married Minnie Toban in 1937, and they had two children (Milton Toft and Arthur/Art Toft). He became a furrier in Vancouver, BC. 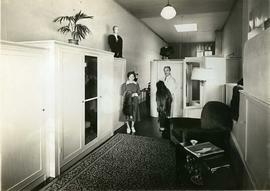 His store was called Alaska Fur Co., and was at 262 West 25th Ave, Vancouver B.C. Fred died May 6, 2006 in Vancouver, BC. Miriam Rivka Epstein (nee Toft) was born 1897. She married Eliezer Leifer in Russia between 1914-1918. After their marriage, Eliezer Leifer was taken by Russian soldiers to fight in the first world war. It is not clear what happened to him. Miriam traveled to be back with her family once Eliezer was taken away to fight. She had a son by Eliezer, named Aaron (Aharon) Leifer, who was born in Russia. She traveled to Winnipeg with son Aaron and half-brother Fred Toft at an unknown date. She married Israel Zelig Epstein around 1932 in Winnipeg, Manitoba. She had two children with Israel: Anne Ruth (Channa) Epsetin and Saul Epstein. Miriam died May 6, 1982 in Winnipeg, Manitoba. Altke Viner (nee Toft) was born in 1903 in Lithuania. She married Ephriam (Laibke) Viner and died at an unknown date in Lithuania. They had one child together: Liable Viner. Saul (Shaul) Toft was born ca. 1901 in Lithuania, and died ca. 1918 in Lithuania. Harry (Chonka) Toft was born in 1905 in Lithuania. He married to Clara Bronwine in Winnipeg in 1933. They had four children: Bernard Toft, Beatrice Toft, Marsha Toft, and Gail Toft. He died March 18, 1981 in Vancouver BC, Canada. Dvorah (Devierke) Toft was born in 1914 in Lithuania. She married Ephraim Shulma and had two daughters. She died at an unknown date. The fond consists of textual records and photographs related to Minnie Toban and later Minnie Toft, including recipes, certificates, correspondence, newspaper clippings, school certificate and report cards, material on congregation Schara Tzedeck, and other related ephemera. Created by Caitlin Lindsay March 4th, 2015.